Kourtney’s relationship with Scott was hitting another rough patch on tonight’s all-new episode of “KUWTK”. Kourtney’s family had had a Christmas party. Both Scott, as well as Younes, were invited to it and they had been fine at the party. The two men hadn’t been a problem and so Scott had thought everything was cool between the three of them because he had been in a good place with Kourtney. Only Kourtney went on to find out a few days later that Scott had introduced his girlfriend to their son Mason. Scott hadn’t thought it would be a big deal because he had been with his girlfriend for a while by that point and because the kids had already met Kourtney’s boyfriend, however, Kourtney had thought Scott was in the wrong. She had gotten angry about her son meeting this girl because she said Scott should have talked to her about it first and so that caused Scott to be angry. He didn’t think he should get her permission if she wasn’t going to ask him for his. But the Kardashians had been split. They heard it from Kourtney first and how she had been going to therapy with Scott yet he had never mentioned the meeting and so they tried to be understanding as Kourtney became upset. Like she had been left in tears because of what happened. The family hadn’t wanted Kourtney to be crying and so that’s why most of them hadn’t really asked questions so the one person that did ask was Kris. Kris called Scott and she got his side. He told her how unfair Kourtney was being and she had snapped at him because she was such a control freak. And Kris sided with Scott. She didn’t get why her daughter felt there was one rule for her and should be another for Scott. Scott didn’t have to clear everything with Kourtney because he also got a say when it came to their kids. Scott had even felt validated after talking to Kris because Kris as Kourtney’s mother admitted her daughter didn’t always react well in a confrontation. Scott had felt so sure that he had no reason to apologize that he went back to therapy with Kourtney and talked to her afterward back at the house. He told Kourtney about how she tends to control every little thing and he said that there wasn’t a single person in Kourtney’s life that wouldn’t agree with him though in that instance Kourtney had thought Scott was being the dramatic one. She accused him of playing the victim in order to get people on his side and she said how she was on that had been taking care of everything for the longest which was why she thought Scott would talk to her first. And then he had gotten so upset that he left. The two of them wouldn’t come to an agreement about whether Scott had been wrong or not and so they went back to arguing their side to other people. Scott would go back to Kris and he’d complain. He admitted that it had been an accident that his kids met his girlfriend and that he had just tried to make the best of the situation. Scott had only gotten angry when Kourtney came at him and he hadn’t been able to see how or why Kourtney would be upset until Kris started to tell him how it had been for her. She’s been where Scott is and she said that Kourtney had been burned before. That doesn’t exactly excuse how she got in Scott’s face but it does explain why she would be on the defensive. 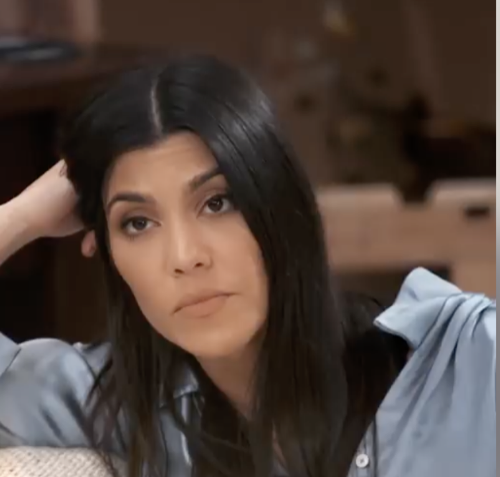 She believes she has to protect her kids and if Scott had been upfront with her rather than letting her find out from their son – Kourtney wouldn’t have reacted the way she did. Scott later apologized for his part in the argument and soon Kourtney saw his side. She realized she should have tried to have been understanding of him and what it must be like as he’s trying to have a relationship, so through talking and another therapy session they both backed down from this one fight. They remembered how they needed to co-parent first and, despite this upset, they were going well at doing that. Its just took them some time to see the other person’s view and once they did it was back to normal although Kourtney ran into a new problem with her family. Her family had agreed to do Celebrity Family Feud because Kim was obsessed with the show and had volunteered them. And well things began to unravel right after that because Kim had then gotten obsessed with winning. Kim had tested all of them before the show. She had thought Kourtney was too slow and that made Kourtney drop out. Except Kourtney wasn’t the only one that dropped out. Rob hadn’t wanted to do it and neither did Kylie yet it was called Celebrity Family Feud and so Kim reached out to her best friend Jonathan when they couldn’t get in touch with her grandmother. She had gotten Jonathan to agree to come out and he flew out to LA from Miami because he thought he was doing the show. He came to LA and then grandma came. She had wanted to do the show and the Kardashians thought she should kick off Jonathan seeing as he wasn’t family. And Kim hadn’t wanted that to happen. Kim thought that was unfair and the rest of the family didn’t think she should have an opinion on who should be on their team when she jumped ship. Kim had left the Kardashian Team to join her husband Kanye’s team. His family was going up against the Kardashians and so Khloe asked why Jonathan couldn’t be on Kanye’s team because he was Kim’s best friend but Kanye wasn’t going to kick off his cousins at the last minute. So the families brought in Steve Harvey and Steve arranged things so that no one got kicked off. He allowed Jonathan to have a partner so to speak and that meant Team Kardashian had six members over five on Team West. And so it was funny when Kim, who had been so desperate to win, had eventually lost because the people she made sure was on the other team were really great at the game. The family had a really good laugh at Kim’s expense because of that and it didn’t help when they found out she got carpal tunnel syndrome from taking too many selfies.